TABASCO® brand Chipotle Pepper Sauce --- 2-1/2 oz. Sichuan peppercorns --- 1 Tbsp. Cumin seeds --- 1 Tbsp. Extra-virgin olive oil, divided --- 10 oz. Light soy sauce (or tamari for a gluten-free version) --- 3-1/3 oz. Good-quality red wine vinegar --- 1 Tbsp. Sea salt --- 1 Tbsp. Sesame seeds, toasted --- 1 Tbsp. Make a Sichuan dressing: Use a flat hot plate or frying pan over a barbecue to toast Sichuan peppercorns and cumin seeds for a minute, until they release a toasty aroma. Allow to cool. In a bowl, add 3-1/3-oz. olive oil, soy sauce, sugar and red wine vinegar. Crush toasted Sichuan peppercorns and cumin seeds over the liquid, add TABASCO® Chipotle Sauce, fresh, minced garlic and ginger, and mix together. Set aside. Slice eggplants into one-inch-thick discs and rub with olive oil and sea salt. Grill eggplant slices on a barbecue on both sides; continue to apply olive oil and salt to eggplant slices until they turn a nice golden-brown and are just cooked. 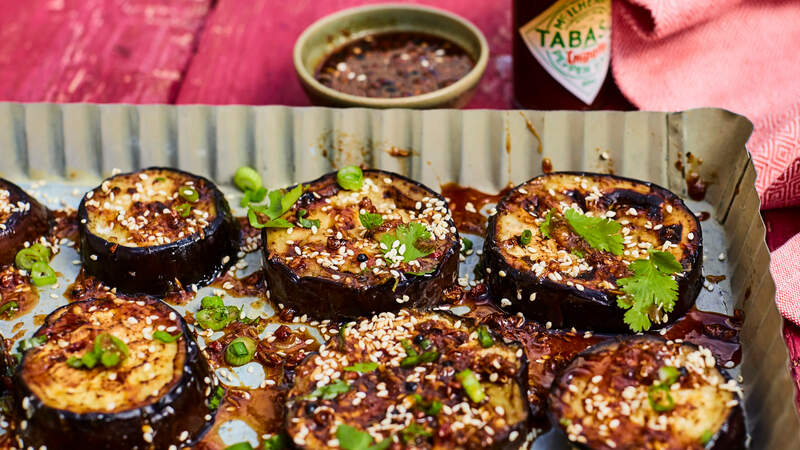 Place grilled eggplant slices on a plate and spoon the dressing over. Garnish with fresh coriander leaves and spring onions, and sprinkle with toasted sesame seeds.